Hello Friends! I'm so excited you love those Bird Crazy stamps and dies as much as I do. Thank you so much for leaving comments on the last couple posts. I loved hearing from all of you and your choices for names were awesome! I don't know about you but I love Halloween. I think it's one of my favorite holidays, maybe because it brings you back to your childhood. Although I can't really remember what I dressed up as a child I do remember the fun, the excitement and the CANDY! My card started with this colorful background. 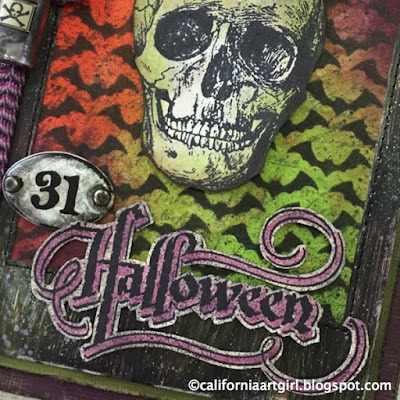 Start by spraying some Distress Spray Stains (Twisted Citron, Ripe Persimmon and Seedless Preserves) onto a piece of Manila Cardstock and let dry. Don't overlap the colors too much or you will get lots of brown. I added the bats with the "BATGROUND" Layering Stencil and Black Soot Distress Ink on an Ink Blending Tool. You can also add a little texture with the Distress Spritzer and a neutral color of Distress Marker like Hickory Smoke. One of the NEW Distress Colors for 2015! The Cabinet Card is painted with Distress Paint (Black Soot and a little Seedless Preserves and Twisted Citron) dry brush style and then spattered with a little Picket Fence Distress Paint. 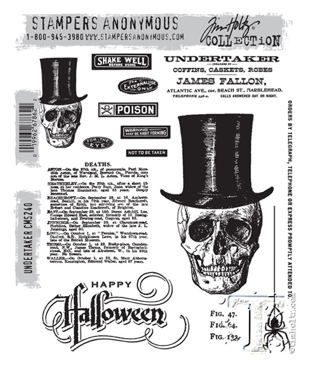 Love this Tim Holtz "UNDERTAKER" stamp set from Stampers Anonymous. So many great elements…backgrounds, focal points big and small, the Happy Halloween in a great font, and the spider…EEK! and the BATGROUND Layering Stencil……the name is perfect! The Undertaker is stamped on to Watercolor Cardstock using Archival Ink. 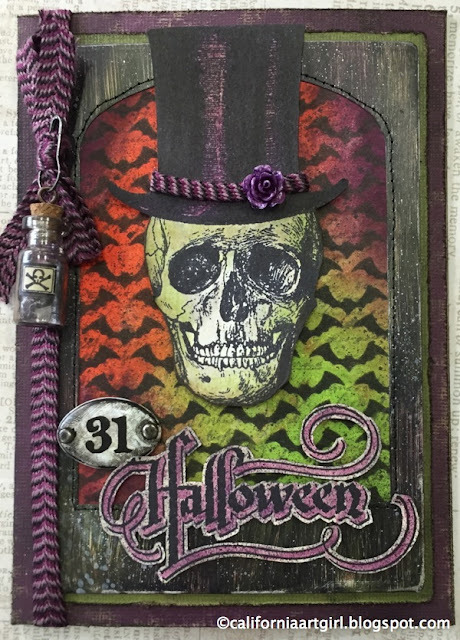 Use an Ink Blending Tool and Distress Ink (Twisted Citron and Gathered Twigs) to add a little color around the edges to make him spooky. I think Twisted Citron is the perfect color! Die your Black and Cream Trimmings with Seedless Preserves for the hatband and tie on the side. The Heirloom Rose in a dark purple is the perfect touch. Don't forget the Corked Vial of poison, add it to the bow with a Loop Pin and a Screw Eye in the cork. ink. Color the Halloween with a Detail Waterbrush and Seedless Preserves Distress. Spritz over it with Hickory Smoke Distress Marker and trim it out with scissors. The Plaquette has a little Black Soot Distress Paint rubbed on it, looks old and creepy now! 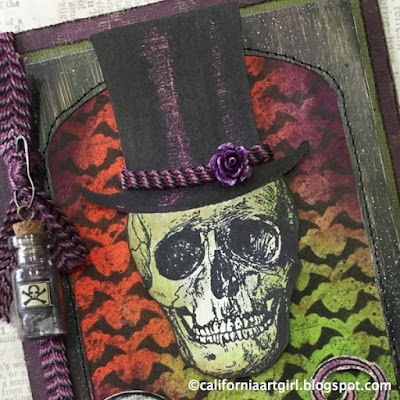 Adding little details to your projects makes them special…like the Corked Vial with a Poison label, stitching around the Cabinet Card, paint rubbed on the Plaquette, the spritzing….What details do you like to add to cards? Here's all the goodies I used from Simon Says Stamp! Hello all! Thank you all so much for the great comments and suggestions to name the graduate. I think Albert (as is Albert Einstein) will be perfect, thanks Annette Green for the awesome suggestion. 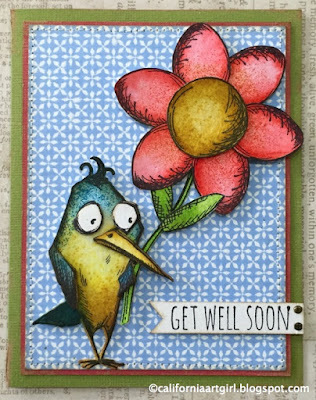 This series of cards has Bird "Things" that I have altered to be something other then their original purpose. Take the balloon for instance. Henriett is busy making some art…she's a little messy. 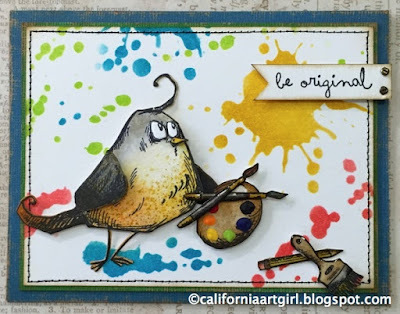 To create the artist palette cut off the little tied portion of the ballon, add a little bit of Dina Wakley's paint and you have the perfect palette. Aren't those little brushes too cute? Sheldon wants to cheer up his friend. This big flower was also made from the balloons stamps, 6 oval balloons for the petals and 1 round balloon for the center. Don't forget the leaves, there are just the bunny ears. Max is sporting a bow tie with polka dots. The bow tie is over stamped with the polka dot tie using a stamp positioner. Easy peasy!! 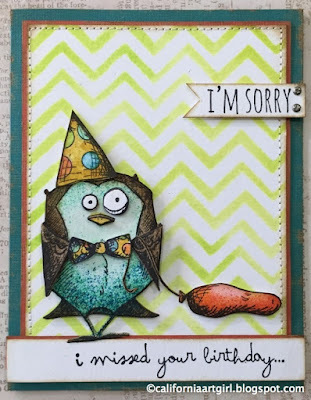 I think Sheldon is a great name for this "Bird Crazy" a great suggestion from Marcie Lovett for the grad bird but I think it's fitting for this one. Meet Sheila, Sheldon's younger sister. She loves going on vacation at the beach! 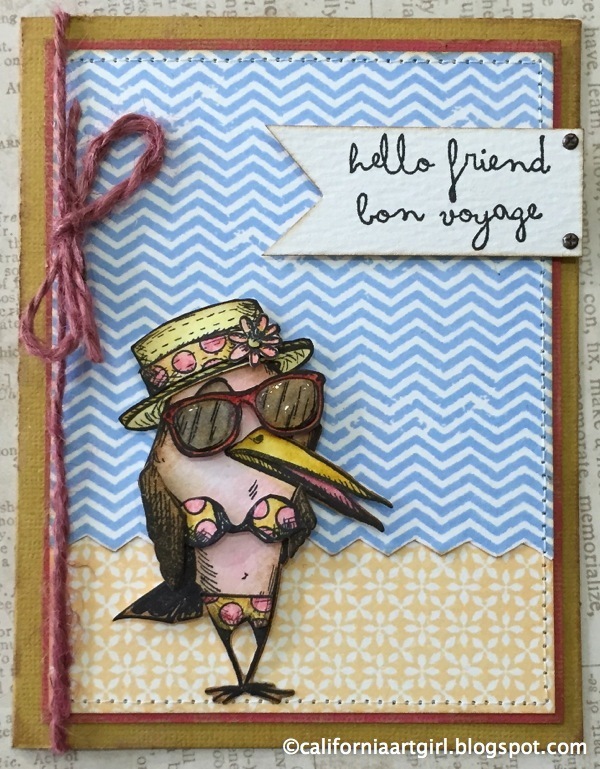 I had so much fun making this one with a little yellow polka dot bikini. The top is a pair of sunglasses turned over and over stamp with the polka dot tie. Don't forget to draw in a little mark for here belly button. I'm having so much fun with these guys…maybe a little too much fun! What will you make with these cute little "Bird Crazy" and "Bird Things"? Thanks for stopping in and I hope you are having a creative weekend! 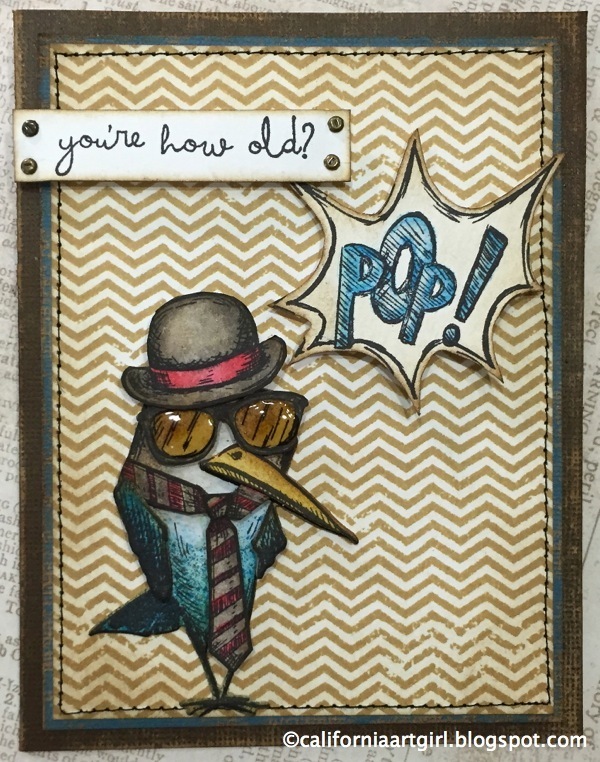 "Bird Crazy" just got better!